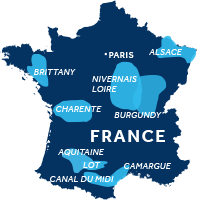 A boating holiday is a perfect way to enjoy the spectacular scenery of the French waterways. Discover the beauty of France and its countryside from the country's canals and romantic rivers. With Le Boat you can explore the sights or stop at any time to relax, indulge in fine French wines and delicious food. Choose from 10 regions with distinct scenery, gastronomy, culture and charm and explore them at your own pace, aboard your self-drive boat. Since the flooding in late October we have worked tirelessly with our local partners to make sure our Canal du Midi services will be fully operational for the 2019 season, which will begin mid-March. The French navigation authority, Voies Navigables de France, have invested over € 4 million to restore the area. They have rebuilt structures along the waterway, removed debris and reconstructed towpaths, ensuring that the UNESCO World Heritage Site is completely restored.